Click on the photo to see the video. You will be amazed. 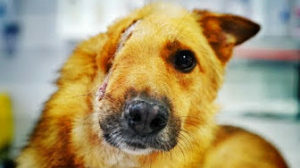 Yes, this is the face of animal cruelty, but it is also the face of Inspiration. Although, Skye doesn’t completely understand, he knows that these people are trying to help him and he trusts them. And these people are angels. Watch the video of the head surgeon, Dr. Jorge Llinas, clean the wound and stitch it up. Doctor of Traumatology, Antonio Canadillos observes Skye’s jaw that he will have to unlock. compare your situation to Skye’s. He is a beautiful soul. I strive to be like him, although I fall dreadfully short. There are several more surgeries to go, but in the end, he will be whole again. than Viktor and these Doctors. Click on the photo to watch the latest video. You will learn many more details about Skye’s story. In Skye’s case, and in almost all the cases that Viktor takes on, I believe that vets here in the States would recommend euthanasia citing that the animal would not have a good quality of life, or that they simply could not help the animal in question. 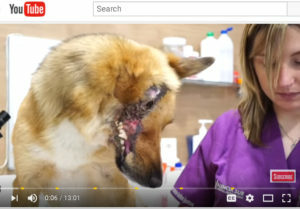 You will learn in the video that no vet in Europe would take Skye’s case, except Viktor’s vet and they will help him, just as they as in so many “hopeless cases.”. Skye will begin his surgeries this week. Click here for Youtube site to watch Skye’s progress and join the conversation. Click here to donate to Skye’s fund. 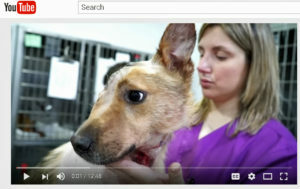 Skye was rescued by Viktor Larkhill who can be found on Youtube. 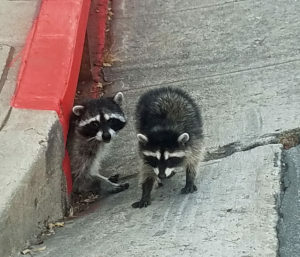 Look what I captured on video when two adolescent raccoons try and explore Downtown Pasadena in broad daylight! 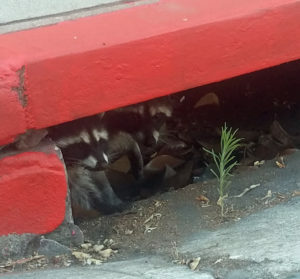 All of a sudden a much bigger raccoon, which was no doubt, mama, grabbed this big boy and drug him back into the storm drain and out of sight. It was actually the second time she did this. The first time I didn’t catch it on camera and she was clearly angry that she had to do it again. 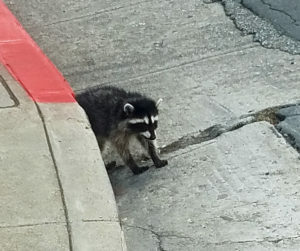 Author Justamis2015Posted on June 7, 2017 Categories Animals in the NewsLeave a comment on Look what I captured on video when two adolescent raccoons try and explore Downtown Pasadena in broad daylight! [Urgent – One Click] Sign petition to make Bucheon the first “Dog Meat Free City” in South Korea. JUN 2, 2017 — Nami Kim of SaveKoreanDogs.org and Soi Dog Foundation will be meeting with the Mayor of Bucheon on the 15th to show their support for the Mayor to end the dog meat trade and will be presenting the Mayor with the petition signatures we that have collected. Currently we are only at 16K signatures and we need at least 20K to show that the people around the world support the Mayor’s effort to bring the end to the dog meat industry in his city and we want Bucheon to be the first “Dog Meat Free City” in South Korea. So please sign and share the petition TODAY! Also invite all of your friends to sign. We Support Dr. Woo Hee-Jong for the Minister of Agriculture, Livestock & Food in South Korea! Author Justamis2015Posted on June 4, 2017 June 4, 2017 Categories Animals in the NewsLeave a comment on [Urgent – One Click] Sign petition to make Bucheon the first “Dog Meat Free City” in South Korea.